This week the intermediate block got the opportunity to go Pakuranga for our trip 'Te Tuhi'. Today our class got to go and it was fun to be honest, and I enjoyed it. At first Jeremy and Louisa introduced themselves to us and then we headed to the art room where we paint and draw. 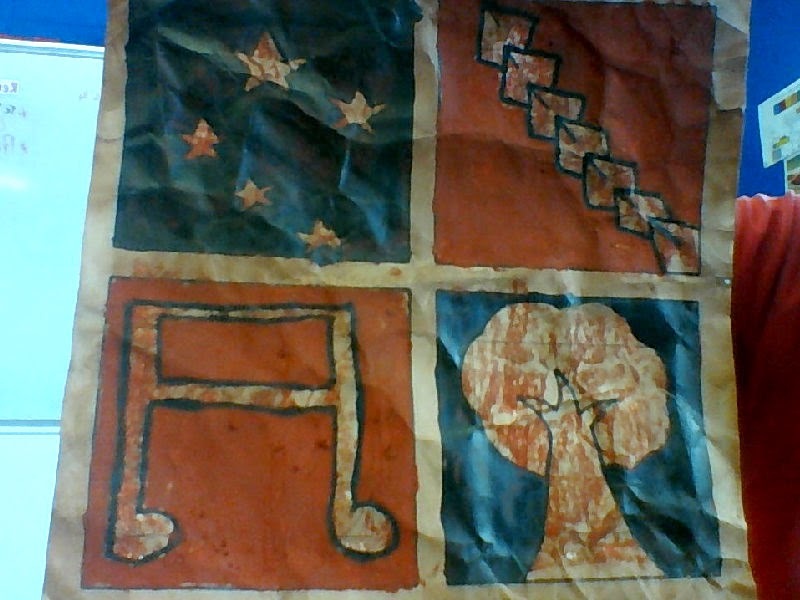 We had to paint tapa cloths and the first step was to crinkle the paper. Then we open it up carefully and put crayon on it. As soon as we finish that then we put dye over the whole paper and let it dry. It was fun but we had to dry it for tomorrows sessions. We learnt so much and we also learnt some pacific words. As soon as the drawing and painting was over, we went around the building and we talked about other different artists and art. It was very abstract and I really liked one other art. It was of sound and looking, the light lines was the very quite part of the art and the very thick part of the art was the very loud sound the artist heard. I enjoyed the trip especially painting and creating the tapa cloths! I would also like to say a huge Thank You to the teachers for providing this trip for us and to Jeremy and Louisa for taking us around the trip.